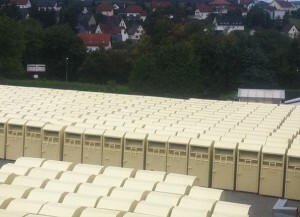 The DTRW GmbH has get the special-use-license for deploying recycling-banks in the city of Aachen lawfully. This has been confirmed by the administrative court of Aachen on April 26th 2016. Via a lotteries-procedure the city has awarded the special-use-license at the beginning of 2015 to DTRW, the Deutsches Rotes Kreuz lodged a complaint. The admittance were refused, which means that the recycling-banks from DTRW can be left and the DRK has to remove its recycling-banks. The city of Aachen has awarded the rights for putting recycling-bank newly for getting a consistent and well-groomed impression in the matter of used textiles. DTRW has put 100 homogeneous looking banks in Aachen which are regularly cleared up to three times a week. The surrounding of the banks is clarified proper, so that the guidelines from the city of Aachen are implement consequently.